Today in Texas the weather is absolutely gorgeous – it’s warm, sunny, and a welcome change from the last two weeks of cold rain. That kind of weather makes me want really fresh-tasting food, like pineapple. Truthfully, I love pineapple all times of the year, but it just doesn’t speak to me on a freezing rain kind of day. These tacos will definitely brighten up your weekend. 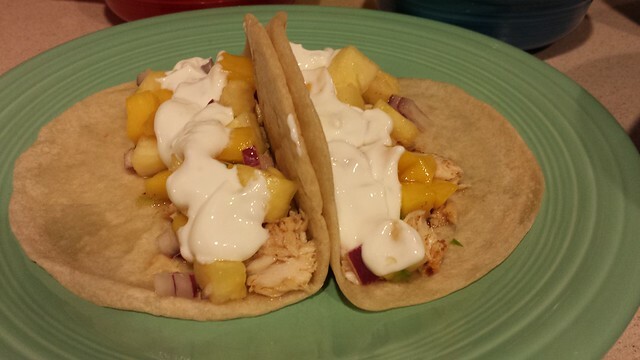 There are basically 3 components: the fish, the sour cream sauce, and the pineapple salsa. I had planned to serve it with some chips and guacamole, but of the three avocados I purchases this week, two of them were absolutely hard as rocks. Robin and I ended up sharing the good one and we skipped the sides. As a side note, avocados are one of my absolute favorite foods of all time, but they are perpetually disappointing to me. They are so expensive and so often they are terrible inside (and I am a fairly good judge of their ripeness). A quality avocado is such a gift – so sharing it with my avocado-loving toddler is a true treat. 1. Stir the cumin, chili powder, salt, and pepper in a small bowl. Rub the spices onto the fish fillets, coating each side. Heat the olive oil over medium-high heat and pan fry the fish for a few minutes on each side. Transfer to a paper-towel on a plate and flake. 2. Zest and juice the lime and add the zest and the juice to the sour cream to make a sauce. It’s the easiest sauce ever. 3. Dice the mango and pineapple, mince the jalepeno pepper and finely dice the red onion. 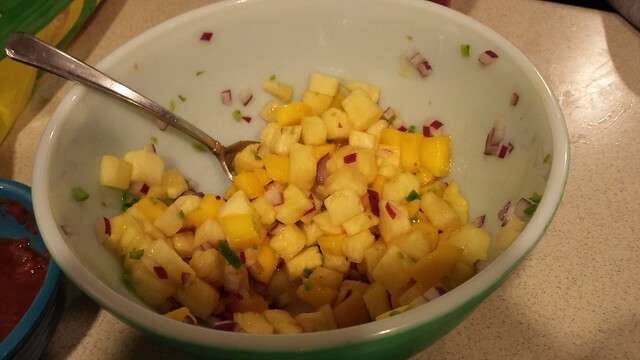 Put the mango, pineapple, and onion in a small bowl, and stir in half of the jalepeno. Sprinkle the vinegar on top and taste – of it needs more heat, add the rest of the jalepeno. 4. Warm the tortillas and top with the flaked fish, the salsa, and drizzle with sour cream sauce.